Made with all-natural, shredded forest products and long-lasting brown colorant. 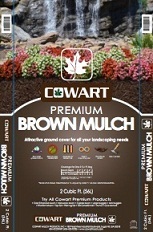 Cowart Premium Brown Mulch has been double ground and screened to ensure the quality of the product. It is an attractive ground cover for all your landscaping needs, including landscape islands, around trees, and garden beds. This is more attractive and a better substitute for pine straw.